If you follow me on Twitter you will know that this recipe started out as a bit of a disaster as I cooked the wrong fava beans. The recipe calls for skinned beans (split fava beans) and I, in my haste to get cooking, soaked and cooked whole beans with their skins on. All was not lost, the cooked whole beans were put to a good, delicious use and we enjoyed several meals of ful medames which you will also find here on the blog. There are so many various recipes for falafel in books and on the internet, all with slightly different amounts of spices I didn’t really know which one to pick as a starting base. After searching for far too long I eventually found one from a sadly defunct blog called World Cup Food and they adapted this recipe from Memories of a Lost Egypt: A Memoir with Recipes by Colette Rossant, a book I shall be looking out for to add to my already overloaded book shelves. 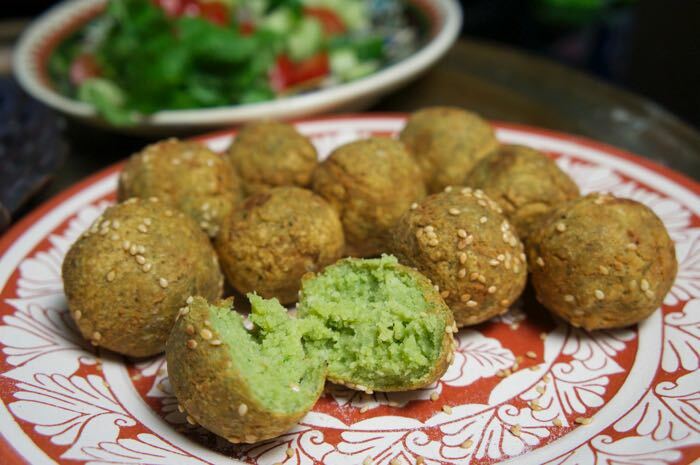 Having spent some time in Israel when I was much younger I remember eating falafel from street vendors and these bought back some very happy memories of my time spent on a Kibbutz when I was a dizzy youngster. These were lovely, in hindsight I should not have whizzed the beans the final time to mix them together as I think that last blast in the food processor just overworked the beans and made the mixture rather too firm, resulting in a slightly dry quality. 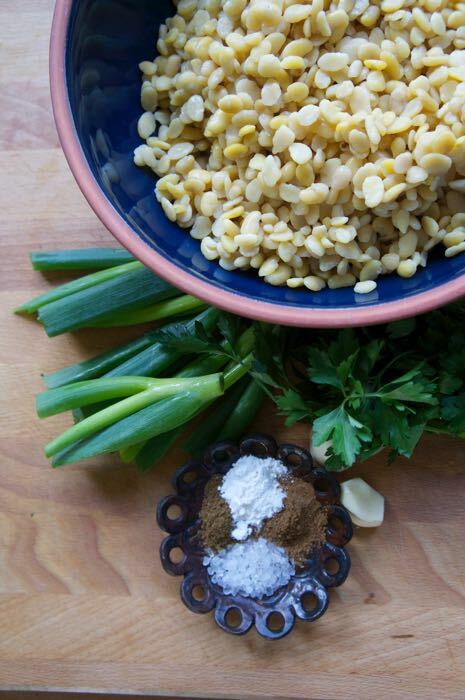 The next time I will mix by hand to give a looser texture which would make for a fluffier falafel. The fabulous green colouring comes not from the fava beans but solely from the parsley and onion tops. It really is an amazing colour, almost looking as though food colouring has somehow sneaked its way in to the recipe. We ate them as I did from the streets stalls, with a little salad and tahini sauce in pitta bread. 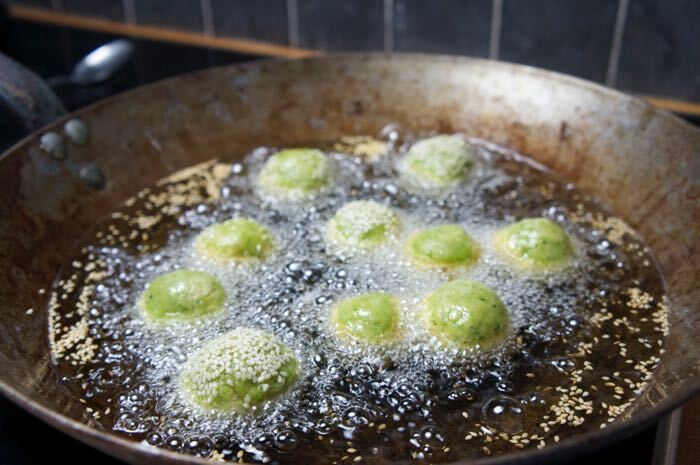 If you watched the recent episode of the BBC’s A Cook Abroad with Dave Myers, you may remember he had trouble when frying his falafel and I have read several accounts falafel frying disasters when the little balls or patties have more or less disintegrated in the frying pan. Mr Myers realised his mistake when he travelled to Egypt and ate falafel from a street vendor. 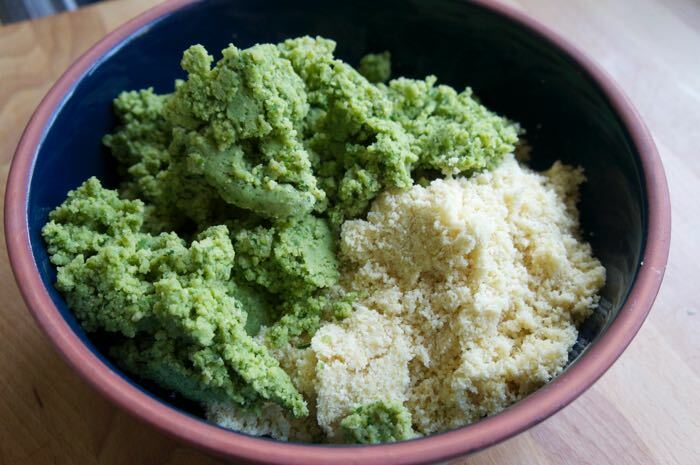 If making fava bean falafel, the beans are just soaked overnight, there is no need to cook them first and this seems to account for the felafel failures. This amount made 20 golf ball size balls which was far too much for three of us. They are so cheap to make and with the addition of some salad, tahini and flat breads make a great dish for an informal lunch for friends on a sunny day in the garden. The preparation time does not include soaking the beans. Don't forget to soak then overnight. Whizz half the drained beans in a food processor until nearly smooth. Put the rest of the bean and the remaining ingredients in the processor and whizz until smooth. Add this mixture to the rest and mix together. Shape the mixture into little balls, think golf ball or a little smaller. 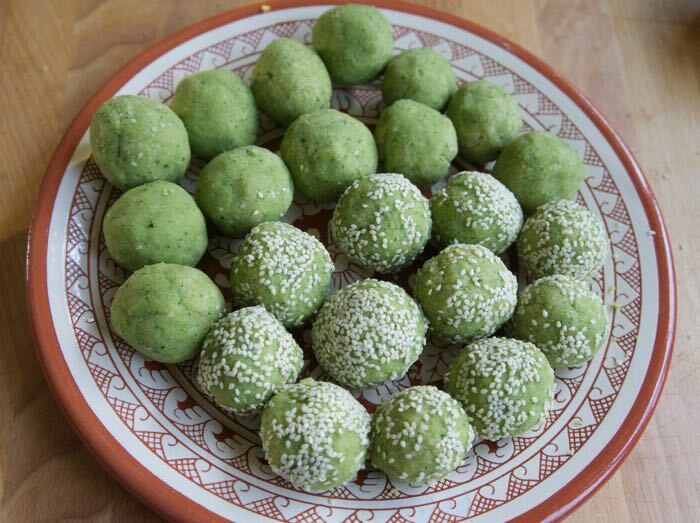 Roll in the sesame seeds in using. Heat the oil in a large deep sided frying pan. Put in one falafel to test if is hot enough to fry, the felafel should sizzle away quite vigourously. 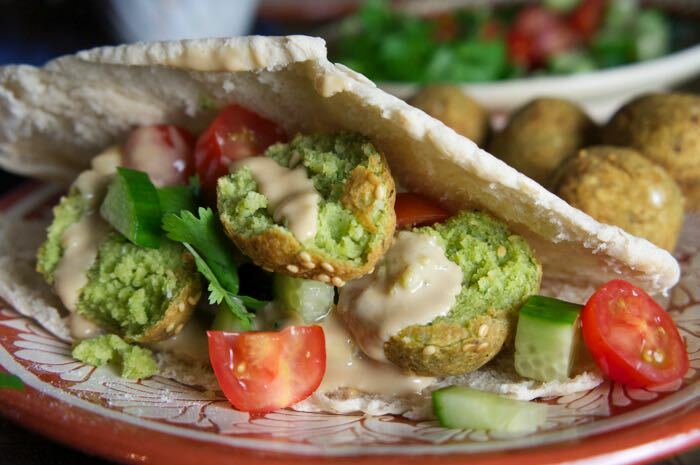 Fry the falafel, turning frequently until they are golden brown all over.